Based on the title and/or description of certain games, they really don’t seem all that great, and yet… some are. Cat Goes Fishing is a great example of this, as prior to playing, I was convinced it was simply some gimmicky thing. Boy was I glad to be proven wrong in this case, as the darn thing actually cranks fishing up to 11, complete with bombs, rockets and a fully featured upgrade system. At its core, fishing is a patient / lazy man’s sport, in that it mostly involves sitting around waiting, and waiting, to then wait some more, until that magical moment when you’ve hooked something. Normally this would be when you’d pack up and head home to prep the fish for a tasty meal, but in Cat Goes Fishing, you’re in for the long haul. There’s a constant lure (get it?) of improved/upgraded rods, new equipment and other things that tweak the experience. How about a fancy bomb to scare off predators, so that you may safely catch the fish you need for that next quest, without having to deal with them potentially snatching your bait? Or maybe you’d rather drop $400 on a rocket, enabling you to cast further, into more lucrative waters? Definitely no shortage of things to spend your hard-earned money on, even if working towards that next upgrade / completing the later quests do end up feeling a tad grindy. 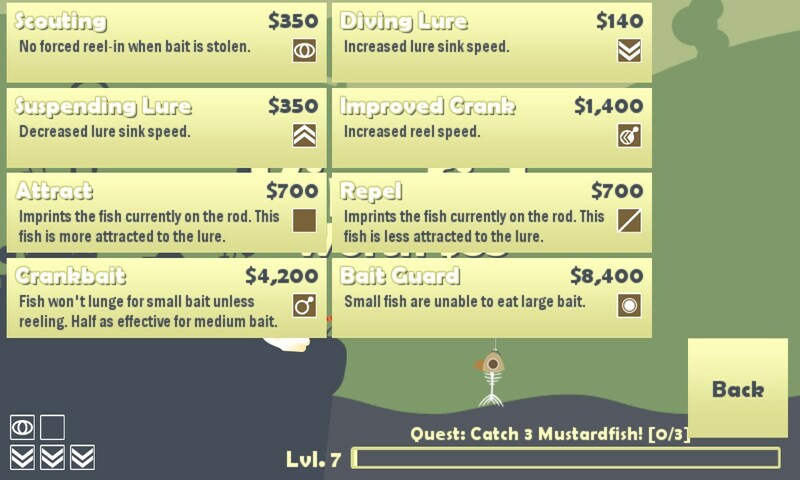 See, you only have two options for stacking greens in this game: completing quests and selling each catch. Oh and get this: the latter will decrease in quality, should something bigger manage to take a bite before you’ve reeled it in. Yup. Survival of the fittest/fastest for sure. This is where upgrades (and bigger, better rods) come into play, as you’re able to attach – and swap out as you see fit, at a cost – a certain number of tweaks to your rod, improving one or more aspects. My personal favorite? Making the lure sink faster. But if you’re the more impatient sort, go for increased reel speed instead – or mix and match! Far as I can tell, quests – which nets you a significant monetary reward upon completion – all involve catching one or more fish of a certain type. This makes the addition of a catalogue with pictures and descriptions for potential locations rather, well, invaluable. 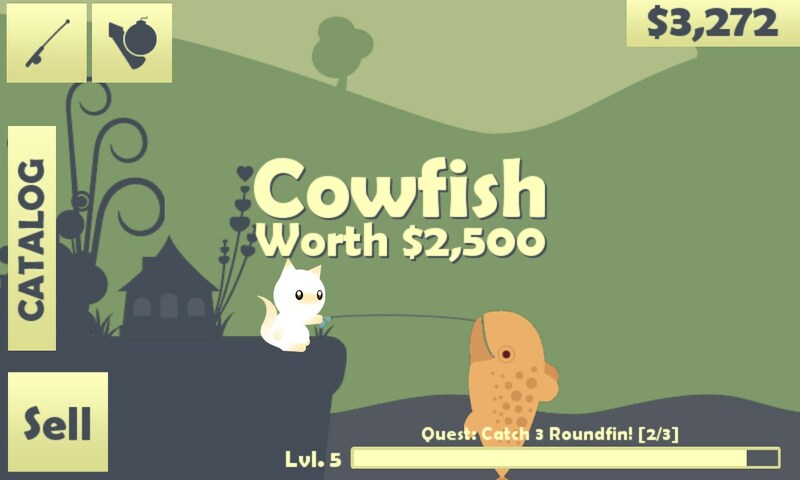 That said, like most things/features in Cat Goes Fishing, this too is unlocked by reaching a certain level (catching fish and completing quests fills the bar bit by bit). Level 3 lets you access the catalogue, while the lure shop (for the aforementioned rod tweaks) opens at 5, tool shop (bombs! rockets!) at 6, and so on. But while all that’s great fun, what really got me hooked is how fishing is handled. Like in, say, golf games, casting is done by way of a timer – click once to begin, then at the right moment, another click will fling the lure far away, into the depths. This mechanic takes some getting used to, as depending on where the fish you’re after currently reside, you’ll want to vary the distance from time to time, meaning you can’t simply go full power and hope for the best. Well, you could, but chances are nothing will be there to bite after a while. Start out on an island with nothing more than a basic rod. Progress into a radar-wielding master fisher-cat scouring the sea for the biggest and baddest fish. On top of that, you’ll also want to keep an eye on what lies ahead as you reel your catch back in, because as I mentioned earlier, bigger fish would like nothing more than to – literally – take a bite out of your profits. 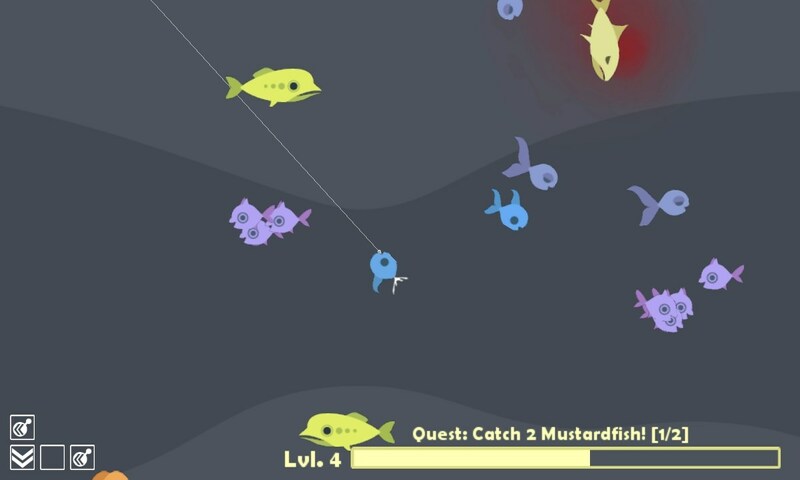 No quest progress for half-eaten fish either, so… pace yourself when reeling. Trust me, nothing’s worse than having steered your bait past a bunch of fish, hooking the one you’re after, only to then have some big fella snack on it. All in all, the game surprised me a great deal, and definitely provided more entertainment than I expected, based on screenshots and the developer’s description. Also, in spite of being a very casual experience, chances are it’ll still manage to hook (so many puns in this review!) even those with zero interest in fishing, courtesy of a solid upgrade system and the potential for, well, catching a shark. Not even joking, as the catalogue does in fact feature a shark, with a $16,000 price tag. Bet ya saving up enough for shark fishing gear is gonna take a substantial amount of fishing though, but hey, that’s shark fishing for ya. Besides, patience is definitely a virtue when fishing, whether it be the real deal or in… Cat Goes Fishing. Cat Goes Fishing is available for Windows from Steam, where it carries a $6.99 price tag.